“Nite Lite” (Dir. Mariah Dunn) won a Kay Kyser Award for Best Student Film at the Carborro Film Festival on Nov. 20th 2011. 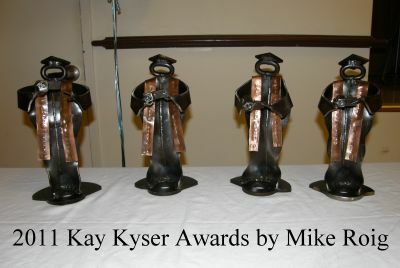 Carrboro Film Festival Kay Kyser Awards, are individually crafted by Carrboro sculptor Mike Roig. The awards are made entirely from recycled materials, primarily from right here in Carrboro. Every year brings new awards, and each piece is a little different.